Are you thinking of entering the equity markets now? Are you thinking of buying some equity mutual funds? You must have heard by now, how the markets are back in action, reaching highs again. Today, I am not here to discourage you and say “Don’t enter markets” or “Its time to exit” — because neither I or anybody else can predict it. We are here to take decision based on what we can control; and the market is definitely something, which no one has control over. The first thing you should understand clearly, is that it’s not the best time to enter the markets for the long-term, because markets are not back in action from last few weeks. It was back in action 1-1.5 years back when markets started rising from 8000 to current levels of 20,000. It has already given 150% return on an absolute level or 100% CAGR 🙂 and the retail public is now waking up like always to enter with all its money for “long-term”. Lets us see in this article some good practices and what you can do at the moment . We, as investors have to be very cautious and not lose our control. It has been 30 years now, that markets are in existence and these kind of situations have come along loads of times. Let’s make sure, that this time we do not regret like we did before. IPOs have started coming in and we recently saw one of the biggest IPO of Coal-India in the history of Indian markets. All the news channels are back with all the so-called analysts and discussion on how markets can reach new heights and logical explanations about economy booming, deep valuations and what not. Markets are nearing an all time high of 21000! It has come a long way from 8000 to 21000 in last 18 months. For investors who bought equity funds or direct stocks at lowest points, it would be a good idea to book profits or rebalance their portfolios. Look at your investments in Equity as growing a tree. When you invested 1 yr back, you had started with a plants which over these 1-2 yrs have grown to a tree and now is the time for you to pluck the fruit; at least book the profits partially if you don’t want to sell everything. Note that it does not mean that markets will fall or should fall. But rather than trying to control what markets are going to do, concentrate on what you can (and should) do at the moment. Don’t loose your sleep over what will happen in markets, reduce your tension by booking your profits partially atleast. Incase you had bought stocks, mutual funds randomly without any proper study, you should immediately get out of markets. Right now, there are two really important influences that can affect your investments. One of those is Market direction and the other is Self-Direction. Market direction is something you can not control and it’s almost impossible to predict. However, self direction is something you can control. Let’s look at a couple of different scenarios and what they mean! If your Rebalance :: In case you rebalance right now , you will have 1 lac in equity and 1 lac in debt, The equity component will go down from 1 lac to 50,000 and debt component will rise from 1 lac to 1.08 lacs. Your total worth would be 50k + 1.08 lac = 1.58 lacs. That would be a 21% loss overall . If you Dont Rebalance : If you don’t rebalance right now, you will have 2 lac in equity and it will go down from 2 lac to 1 lacs – a 50% loss overall . If your Rebalance : In case you rebalance right now , you will have 1 lac in equity and 1 lac in debt, The equity component will go up from 1 lac to 1.5 lacs and debt component will rise from 1 lac to 1.08 lacs. Your total worth would now will be 1.5 lacs + 1.08 lac = 2.58 lacs, a 29% profit overall. If you don’t : You will have 2 lacs in equity and it will go up from 2 lac to 3 lacs – 50% profit. You can see by this small exercise that in one case you are going to see 50% loss or 50% profit and with another case you can see 21% loss or 29% profit. Now it’s your choice. Which situation are you more comfortable with? I personally feel, retail investors should concentrate more on limiting their losses. 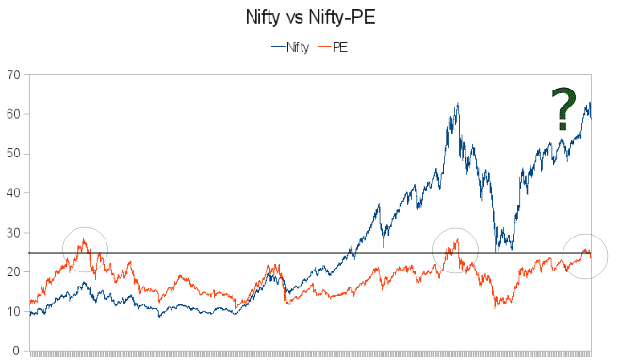 Where is Nifty PE ? The Nifty PE has been a good indicator in the past to judge overbought and oversold situations . One problem with Nifty-PE though, is that it can’t give you precise a timeline, for when markets can start rising or falling. Nifty PE right now is somewhere around 25, which has proved to be an overbought situation historically. In the past Nifty PE has reached this level before markets fell after few months. It happened in 2008 crash. On the other hand, a high Nifty PE also indicates strong momentum and can be seen as an opportunity to make some quick trades by entering on the weaker days. So it’s your choice on how you want to look at the situation . Note that Nifty PE at the moment is very much near that previous high’s of 25, where markets crashed, but it can still go to 27-28 or even 30 in worst case, which can take another 3-4 months and then market can fall ! severely . “This current fall of 1200 points on sensex is an obvious downside which always happen after a spectacular upmove and it is nothing but a pure profit booking correction which has happened in last 1-2 weeks. There is still 1 leg of major upmove remains in markets and unless Nifty breaks support levels below 5700-5800, instead of panicking its a good time to take some positions for short-term of 3-4 months, markets can break the previous levels and reach upto 25000-25000 levels” – As per Hemen Kapadia, a noted technical analyst (I met him at a seminar in Bangalore). So If you are an aggressive investor, don’t sell. Just ride the trend; you can also add some money when market cools off a bit and then ready for the move upwards again. But anyway, you have to be cautious and make sure you have control on yourself. And you should be selling if there are major indications of markets being weak. I am investing in FT India Dynamic PE Ratio Fund of Funds which automatically does portfolio re-balancing at the end of the month. reduces allocation to equities in order to minimise downside risk. This fund will protect from losses and limit the upside as well, but then again it will deliver steady returns and build long term wealth. Manish, thanks for this wonderful blog. I’m investing in Equity and Debt funds in 70:30. I invest 10,000/- each month and planning to continue it for another 25 years. I am expecting 12-15% return and planned my retirement accordingly. How often should I re-balance my portfolio? I have PPF, FD and Gold as other investment means. When re-balancing is it good to move money to these instruments so that I get an average return of 15% through out my investment period. Please point me to articles you have published earlier on long term investment. You can rebalance it every 1-2 yrs . You can read more on https://www.jagoinvestor.com/archives , it has the list of all the articles till date . Can u Please tell me what are Balanced Funds? and Why do we need to invest in them. I will give you a analogy , some people like spicy food , some like totally non-spicy , but some like a bit of spice , not too much , so they put less mirchi and masala in their food , so they they dont burn their tounge, but still enjoy taste of mirchi and masala . In the same way Pure Equity (shares and equity MF) are like mirchi , if you have too much of it , you might burn your taste, so people who still want to taste it but not too much , go for balanced funds which have limited exposure to equity like 60-65% , rest 40-45% is in debt , which is safe, thats why they are called Balanced ! . I hope you got it ! thanks manish for your valuable advice and simple explanation. hi manish, i wanted to ask u something regarding my carrer… as nw i m studing in bba 2nd year n i m very much intrested in learning abot stock market, mutual funds..etc.. and also i m workin as a insurance agent for sekking knowledge and also for my pocket money.. i do invest in stock market and mutual funds throung sip but very small amount… in future i want to do mba in finance.. n i also heard abt d ncfm modules.. is it good for giving dat modules.?? does it make ane impact on my resume aftr my mba whn i apply for a job in mnc? how much impact does it make??? if it is good to give dat modules exam, den pls tell me wich wich shuld i give first n so on..?? or else tell me some other courses or certification dat i should i go for for makin my resume much powerful n get a well sound pay job… thank u..
I’ve been following your blog for quite sometime. I like your views. I’ve been investing since 2003 september (I got job in 2002 July) and I wish I had your blog then! Just like you, I am also system engineer in one of the s/w companies. I want to save 30k to 50k per month(This amount will increase with time) and buy a home btw 5 to 10 yrs from now. The home that is of my interest costs me around 80L today. My goal is to pay of 70% of the price at the time of buying. I assume that home price will be doubled in 5 yrs from now, in the worst case. Assume I have no cash reserve now, what is the investment tool I can use to meet my goal? I am familiar with MFs and equity, but a bit scared to put such a huge amount into equity SIP or equity MF. I am not the kind of person who would do daily trading, still I am not sure whether with SIP I can invest such a huge amount and be sure of returns. Your suggestions will be really helpful. If want to make better returns than plain FD’s or risk-free investments, you cant say “I cant take risk” ! , you have to take it ! I strongly believe that if one is going to invest for a very long term , say, 20 years, then the level of index(sensex) does not make much sense.. because during those 20 years there will be frequent bull phases and bear phases, over which an individual investor has no control whatever. However if an investor’s time frame is say 3 years then it makes sense. Also there is no valid theory to prove that portfolio re-balancing can give better returns. 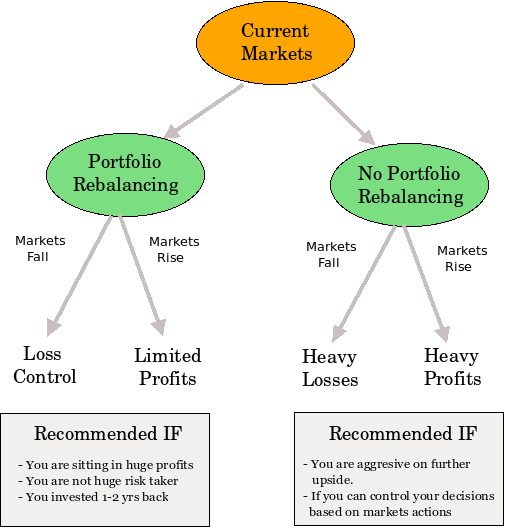 Portfolio re balancing is only a method to minimize the risk ( and not to maximize the returns) . I am not sure on your statement “Portfolio re balancing is only a method to minimize the risk ( and not to maximize the returns) .” . I think its portfolio diversification which helps in minimizing risk , portfolio rebalancing would yield better returns than plain buy and hold depending on what time frame one is rebalancing . Thanks Sreedhar for a very good article. Personaly, I have sold all stocks that are above their intrinsic value and sitting on cash mostly. I have put some on floating rate funds with a clear intention to switch to equity when opportunities arise. I am sitting mostly on cash. I do not really believe in this mathematical rebalancing per se. My principle is always go for an asset class that is cheap (based on its intrinsic value) with good return potential for future. If you do not find any, sit on cash or put your money in FD and wait patiently. Action does not equal performance. Sometimes we are better off doing nothing than just acting for the sake of it. As I said, this is my personal choice and folks should do what they think is best from their perspective. Its a probability game. If you know that market can go up by 20% from here and you give it a probability of say 30% and if there is a chance that market can down (reversion to mean of long term PE of nifty) by say 20% and the probability is 80% then the outcome is +0.06-.16 which equal to -0.1. When you see the total outcome you lose. We are better off not investing when the total expected outcome is negative. As I said before, these are individual decisions and there is no one strategy that fits for everyone everytime. Great performing managers have one thing common. They dont play just for the sake of playing. They bet only when odds are in their favour else they sit on cash. Warren Buffet, Charlie Munger and Seth Klarman are good examples who do not mind sitting with 40% cash at times. When I say sit on cash, I meant floating rate fund or any instrument that provides some safe return but gives you the liquidity to switch when the opportunity arise. It is okay for me if I can just make the current interst rate rather than having a big probability to lose my principal. One small correction to the last comment, the market probability of going down should be 70% (as going up was 30%) and the total expected outcome would be -.08. In the probabilities game, the chance of markets going up is 50% and the reverse is also 50%. That means total outcome is zero! Corrections and rallies are part of all types of markets. Only with a hindsight bias, you can say that this was a normal bull market correction or start of the bear market and vice versa. All the 3 persons that you have mentioned are astute investors within subsets of value investing and their performance is rare. But I will be very surprised if any of them looks at the indices and says that this is the time to sit in cash. They will search and search for severely underpriced assets and buy them, and only if they do not find such assets will they sit out. All of them look far far ahead in future. As should all investors if they really want to make money. Good point , Technical analysis is based on this point only .It tells us good points where on can take trade bases on high odds , like when market went to 6300 recently , the chances of downside was very high and upside was limited, so the overall expected outcome was negative if you combine both upside and downside . So it was worth taking a call. Also you have assigned probability for upside or downside, but not “side-ways” , you should better take into consideration the time also . If might happen that upside is there in next 1 week , but high downside in next 1 month ! A very good post to suggest rebalancing the portfolio. While, the whole rebalancing idea has been posted well, I thought this kind of one size fits all kind of rebalancing of equity:debt does not seem to be advisable to be applied in this scenario that we currently are in. Look at what is happening to the asset classes around us. Debt, Realty, Equity, Commodity and any other asset class we can think of, are all at its peak. Its a liquidity driven market where the stupid decisions taken by FED (US) is driving this cheap money towards all these asset classes (including emerging markets). The macro picture is that its a bubble that is building up everywhere (this includes debt). So, you should assume that the debt (aka debt mutual funds and bonds) are as risky as equity and that could fall 50% (hypotethically) too if the inflation takes off (which is very likely given the scenario). What I am trying to come too is, people should not be under false impression that debt is safe. It is not. Better advise would be to sit of as much cash right now as possible. Put the money in floating rate funds or keep it in liquid fund or safely in bank or under the mattress. Wait for the correction to happen and then deploy in the right place. This is the most difficult advice to follow but the right one at this juncture. I think that is the right kind of rebalancing advice that we should give right now. Please note that these views are personal and are not meant to say you are saying something wrong. Keep up the great work. This blog is very informative. So what do you suggest in that case ? Sell and sit on Cash , which might be comfortable situation for many 🙂 . I am still bullish and expect market will reamain stable if not increase. Hence i am ramin silent and doing my SIP regularly (it will average automatically). Please advice. There is nothing to advice in this case . Looks like your risk appetite is pretty good and you seem to be comfortable with markets going down . Thats fine I guess , what levels on nifty do you feel might bring some downside ? I reread this article again and it seems to me that it applies only to those with max exposure to equity 100%(which is crazy!) to say 70%? Not sure if someone with low risk tolerance and with only 40-50% equity exposure should decrease it further. Can you clarify? The other issue is as rightly pointed out by Sundar (whose comments are awesome btw) is tax implication of debt funds. If someone decreases exposure to equity and invests in debts and they finds a few months later the sensex at 8000 and revert back to equity what are the tax implications. This seems messy to me. Yea .. taxation while moving to debt is one point to take care of , I should have noted that point in the article itself . So one has to take care of taxation part while moving to debt . Considering that moving to equity back will happen in next 1 yrs after moving to debt , it would demand some tax to be paid , one has to consider the overall gain by doing portfolio rebalancing minus the tax paid , and if that looks a considerable amount , that would make sense . Again this whole portfolio rebalancing thing on basis of nifty-pe should not take place more than 5-6 times in a 10 yr time frame . manish this article is contradicting to all your previous posts or rather i say principles on long term, not to time market, equity for 10+yrs, stay invested, SIP etc. No , you have not explored every part of my articles in that case . Portfolio rebalancing actually enhances the returns in long term not decreases it. I seriously disagree with this article. 1. 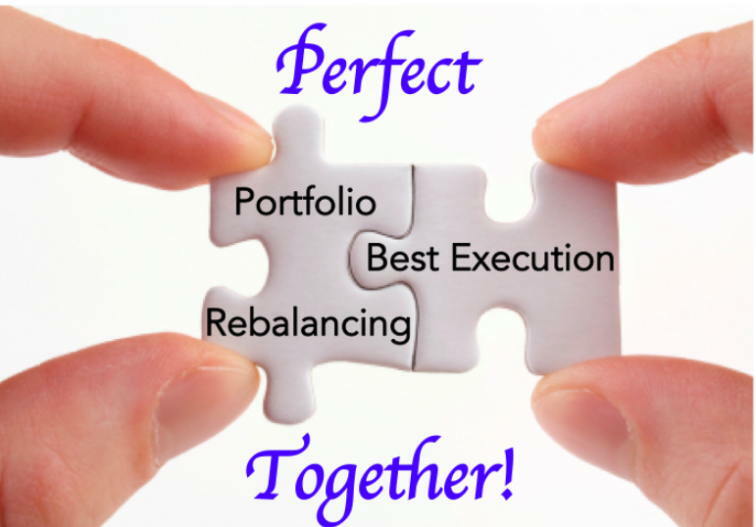 Rebalance the Portfolio. There is no good or bad time to rebalance. It should be done at a more or less fixed interval, say quarterly or half-yearly or yearly. To do it according to market levels is absolutely wrong. If it is time to rebalance now, was anybody doing it at the time when markets were at 8000. 🙂 At that time, everybody was saying this is doom time and your equities are going to get bust, etc, etc. People stopped their SIPs and investment in equities at precisely the best time for investing in them. 2. Two dimensional Possibility – Actually, there are 4 dimensions to capital markets. Either there will be Up-a-lot, Up-a-little, Down-a-little and Down-a-lot scenarios. Except for the 4th scenario of Down-a-lot, one should remain majorly in equities. That means 3:1 possibility and not a 1:1 possibility. If you are looking for only the next year or the next-to-next year, dont be in equity markets. Have everything in debt or something related. But, if you want to maximise the growth of your money, put majorly in equity markets. Be diversified but still majorly in equity markets. 4. If you say rebalance now, I would like to ask you when will you repeat this thing in future. That is, when will you say it is time to get back in markets. At 18000, 15000, 12000 or 8000? Or is it time to rebalance again at 19500? 5. Chartists/Traders work in different ways than investors. If you are in for short term only – work like a trader. If you are in for long term, work and behave like an investor. 1. Why do you think one should not do relabacing based on market levels, one can always make their own rules of rebalacing , i agree that it should be on fixed intervals , but you can make your own overbought/over-sold levels and do rebalancing , it all depends how much involved you want to be . The article even though says rebalance it now as markets seem to be high , it also indicated that you should be moving back to equity when markets are very down and the very same 2008 crash example also qualifies as a rebalacing time . 2. may be you are looking at some 4 rules which are based on text books , I just made my own 2 dimentions and wrote about it . 3. Yes , I agree with you , so only people who want to time the markets , should be doing rebalancing , as its a passive way of timing the markets . For anyone who doesnot want to be involved they should just be invested for long term . 4. as per this example, I suggest using nifty-PE as a indicator to find over-bought and over-sold points . For some one who believes its not the right way of doing it, should ignore the approach or make their own . Its just a suggestions and an idea for discussion , I can see historically this has given betten than buy and hold . Much better ! 5. I am mixing fundamental and technical at very long time frame, it cant be done every week or month , these kind of scenarios arise 5-6 times in 10 yrs . Even an investor has to be active some times and this approach will only make him active quite a few times in years . Even though it looks close to trading , I consider it close to investing for long term only . I agree on most of the things. I think these explanations should have been part of the main article. Rebalancing should be seen in relation with the whole portfolio and not just of the equity funds / stocks. If a person has a big chunk of his portfolio in FDs, savings accounts, endowment policies, PPF, etc and his equity portfolio is already small (most of the Indians have that), then decreasing the already small part of your equity portfolio is not going to help you. The first impression from your article is that since the Nifty PE has reached this particular level, it is either time to get out or dont enter at all (though you have tried to emphasize on rebalancing the portfolio, but most of the people would not understand that part). I have serious objections with the pointing of “particular” levels. Thats all. I dont disagree with using technical and fundamental parameters for timing the market. Use as much as you can to get the best possible return at the least level of risk. ! Your use of Nifty-PE as a indicator is good. My suggestion is if you have identified a overbought condition (as nifty PE increases above 25), then why to balance it to 50-50, go to 20-80 or even 0-100. Why not? Same with a low level, goto 90-10 or 100-0. If possible, that is what we should be doing. And nothing wrong with it. Regarding rebalancing one should also consider the cost of transactions and taxation. Calculating returns without taking into consideration these costs can lead to serious mistakes. My example of 4 scenarios is based on a book but that is a logical thing and not an arbitrary scenario. I would like some good evidence of your approach of rebalancing (include the taxation and other costs) vis-a-vis a buy-and-hold. I am all for a healthy discussion. Very interesting discussion going on this most important subject. Let me add my bit. 1. Estimate total cost for your normal living per year. Add items like insurance premiums, mediclaim premiums and other incidental/accidental expenses and even add cost of cremation. Now invest that much of money to cover the above in stable source of income like PPF/FDs etc. 2. Remaining money be invested in 4 or 5 best Equity Funds as recommended by Manish earlier. 3. Every year after 365 days take out only that amount of money which is needed to match the inflation in your expenses. However if the market is bear grip then don’t withdraw so much. If the markets are at top like now withdraw for next 2 or 3 years increase in expenses and keep it in safe instruments. 4. After above withdrawal become Rip Van Winke. Sleep well and wake up after 3 years and do the above. Thanks for the compliment. I hope more readers will benefit from unbiased suggestion in such good blogs like Jago Investor. Financial Planners (who are actually agents of Funds drunk on their commissions) will be put to shame when they read Jago Investor where real unbiased advice is traded by readers themselves. Thats a compliment for jagoinvestor 🙂 . Yes , the stars of this blog are readers who make an awesome community and shares knowledge in parts to make a complete set of knowledgebase for others . Thats a great strategy ! . Easy to understand and implement ! Thanks for your excellent counter question , which would add further value to this conversation ! . The quantam of rebalancing definately lies on the risk appetite of the investor , one can do 50:50 or 0:100 . I would go with 20:80 for myself ! . Case 2. Entered the market at PE of 11 or below. Kept on buying every month until the PE was under 15. Stopped buying ones the PE is above 15. Exit all at PE 27. Re-entry only at PE at 11 and then buy every month until PE is below 15…and so on. Case3. Case 2 + I shorted the mkt at PE 27 and covered all at PE 11, rest all is same as case 2. Case1. 18% CAGR i.e. 18% per year cumulated annual compounding for 11 years. Case2. 30% CAGR. Rs 100 per month became 78000 after 11 years. Case3. 38% CAGR Rs 100 per month became 122000 after 11 years. Please note that in cases 2 and 3 when I am not able to enter each month, I keep those Rs 100 in Fixed deposits, one my entry level comes(either for short or for long, I liquidate my FDs and enter the markets) so investment amount in all the 3 cases is exactly the same. In these 11 years there were not more than 4-5 buys and 2 sells in case 2 and 3. Case 3 outperformed case 2 and case 2 outperformed case 1. I plan to implement this strategy for my investments. I want to know how safe it is to go short at 27. Isnt it possible that nifty PE might just move into some different range, maybe the next time when the fall comes after say 5 years, maybe nifty PE could be 32 or 33…is that possible? Case 3 gets into a very big risk if this happens. Total invested amount = Rs 11 years*12 months*Rs 100 = 13200Rs. 9-Feb-00 27.4 1689.65 Sold 0.424 nifty @ 1690 = 716Rs. out of the market in feb 2000, total money left Rs 716 + 700(7 months@100Rs) = 1416Rs. Sold everything in dec 2007@5974 price. 7.51 nifty = Rs 44864 + Rs. 25months@100Rs = 2500Rs. Sold everything in dec 2007@5974 price. 8.19 nifty = Rs 48927 + Rs. 25months@100Rs = 2500Rs. Two things for the above post. 1. As per me, this is the so called “datamine”. You bring out data and do some analysis and say this is the return. Without actual real-time performance. Case 3 in point, naked shorting an index (the data looks like that) is very risky and can simply wipe you out leaving with negative returns. Case 2 shows the power of asset allocation but the present example assumes you put money only when the PE is below 15. What if in future, the PE remains above 15 only for say 3-4 years (With recent liquidity, that can happen), then you would not be having any equity exposure! Best of luck with that scenario. Two correct predictions of Severe bear markets in Feb 2000 and Dec 2007 – if I am lucky with even 1 of them, I will get a 50% boost in my investments. My points are continuous innovation is a must. Different investing styles work in different world scenarios. and KISS. Yea .. Even these strategies are not for common man . If one has to take least interest and dont want to waste time ,mutual funds are the best bet. Jeremy Granthem has a 48% accuracy. So take his comments with a pound of salt. What to do if we have started investing in ELSS fund (monthly SIP mode) 2 years ago. We have 1 more year to go. what are the options we have? You have no choice but to sit queit . One thing which you can do is to invest your further money in Debt instruments to automatically rebalance your portfolio . Even if you are investing in a SIP in a ELSS fund, you dont need to run the SIP for three years. You can stop the investments immediatly if you prefer to(Not that i am advising you to do so). What the three year lock in for ELSS means is…Each of your SIP installment is locked for three years. In other words, the units that you bought in 2009 March is locked till 2012 March…And the units that you bought in Nov 2010 is locked till Nov 2013.
yea .. Its nothing but timing the market through portfolio rebalancing . Just like MF are passive way of entering markets , Portfolio rebalancing is a common man way of timing the markets ! Portfolio Rebalancing should also take into account tax implications. If you have made LTCG in Equity Funds then you can rebalance now. If you have STCG in Equity Funds then calculate if it is worth taking the call. In my considered opinion the best option is not to do anything now if your risk tolerance is not breached. If not just reduce the equity component to more acceptable levels. In Indian condition yearly rebalancing after 365 days is the best option irrespective of market conditions. Thats a good point I didnt cover in the article , thanks for mentioning it here 🙂 . There is no issue for LTCG in Equities or Equity Funds. Luckily markets since Oct. 2008 have been on up swing and most investors would have made gains in Equities. But for Debt fund investors Tax laws are not friendly. In the past 2 years the Cost Inflation Index has risen sharply. Interest rates have been very low. All Debt mutual funds when indexed have given heavy losses. If some one had to sell Debt funds for rebalancing he will make heavy losses after indexation. Fortunately that is not the case for today. But how can he recoup his losses in debt fund. Tax laws says it can be carried forward for next 6 years and adjusted only against LTCG in Debt Funds or Property or Gold. Of course International Equities FOFs offered my Mutual funds are considered Debt Funds. But how many are investing in such funds? In this scenario Gold Funds makes Sense. What are the numbers for those “heavy losses” after indexation ? Is it deep negative numbers like 10-20% ? Or just 2-3% ? Value Research shows 6.9% annualised return for Income Funds for the last two years. That is about 14%. Cost Inflation Index published by CBDT is 582 (08-09), 632 (09-10) and 711 (10-11). Now you can calculate the losses. 8% loss for the two years. If you were unfortunate investor in Gilt Fund you will be crying a lot as those return were just 10% in two years. Thanks for the data, I will look more and see if this can be an article . Want to help on article ? guest article ? Managing a Debt Fund is equally challenging as managing a Equity Fund if not more difficult. Most Fund Mangers fail miserably in managing Dynamic Debt fund. They cannot take call if the interest rates will rise or fall. In the current scenario with interest rates on 10 year benchmark at about 8%, what call one should take on Gilt Funds? Is it a buy (expecting inflation to moderate) or is it a sell (expecting QE2 Money to flood India and there by prompting inflation). I got more insight on challanges of managing debt funds . I guess if this is so much messy , periodic rebalancing cant be for a common man on a very short period . I hope govt makes the profit arised from moving from debt to equity tax exempt ! That is a wishful thinking and will never happen. Govt. under no circumstance will make is so easy especially in a country like India where most of the National Savings (95%) are invested conservatively and is source of cheap funds for legal or illegal purposes as well as source of revenue for the Govt. In India where there is no Social Security, each person has to plan for his own self. To beat inflation, there is no escape from taking risk in Equity or Real Estate. In my opinion under no circumstance Equity exposure should be less than 20% for even most conservative investor. We are lucky that like Zimbabwe where cost inflation goes up by 1% per hour. Neverthless our inflation rate is high by international standard. If you want to avoid paying tax from moving from Debt to Equity then only option is balanced fund. Here Funds Don’t have to pay any tax on rebalancing. The other option is just develop your own mind set to accept high risk tolerance. I will go for the second option. Thanks Sundar for bringing out such good data to point out the deficiencies of debt portfolio. You have rightly pointed out the problems with debt fund taxations. I want to enter in the Market with investment of Rs.10000, I have HDFC & IDBI accounts which one should I prefer? Is Service charges are applicable for buying shares or it comes at selling time only? If I incurred losses Do I need to pay service charges?? You can buy the shares from any , no preference . You pay brokerage charges while buying and selling both , brokerage is not dependent on profit or loss . One more thing I would like to ask about Service taxes. Do I have to pay it even if I incurred losses?? Which service tax ? You dont pay it in stocks or mutual funds . 1. Are you implying that having touched 20 K a downhill trend is likely for the sensex? For some one with a goal more than 10 years away is this important? 2. Two dimensional possibility in markets: This seems to be an extreme scenario even to being with. Since limiting losses are important no one should have 100% equity in the first place. Someone with goal within the next few years should definitely book profits and increase debt component. But why should others? For a SIP guy like me this confusing. I was under the impression highs and lows dont matter when you do rupee cost averaging. Isnt this right? Excellent doubts you have raised, I will enjoy while answering them ! 1) When markets were at 15000 , there was chances that markets will fall , when markets were at 18000 , there were chances that it would fall and now at 20k also there are chances that it would fall , just that with each step this “chances” is getting stronger and stronger . So why when do we say that these “chances” are enough for us to react ! . for many still they think that the chances right now is still not that high . So its not just hitting 20k is the reasons, the main reasons are “its a previous top” , “Nifty-PE” around 25 which historically has been a over-sold region , crisis all over the countries which might impact our markets , coupled with all the other reasons , yes 20k is a point where you can say we are near the fall . This near is not that near that you keep looking at market closely and loose your sleep . Before this , it was a time to sit and relax , now its time to get up and be more cautious . For some one with goals more than 10 yrs, Is it important ! , YES and NO , NO if you still expect 12-14% kind of return over long term . It should not make a difference , lesser the action , better it would be , but for some one who has some interest , time, understanding and guts to accept just 8-10% kind of returns in case things go wrong , YES it would make difference . Overall more accurate your timings are , it would boost your returns over time . So if you sell today and the same thing is available at 40% less than what it is today , and you buy it again after say 8 months , this single thing will boost your return by 66% mathematically . 3. Yes , its a important and interesting point to learn and understand , if some one is entering the stock markets for long term , doing it now or later when markets fall , it would make little difference if you are doing SIP (for longer term) , but there are many people looking for lumpsum investents for short term SIP;s like 2-3 yrs , for them this timing would matter a lot , the shorter the time frame the higher would be the imact of timings ! Even for the SIP guy, if he can take these once in a while buying and selling decisions for his whole portfolio through portfolio rebalancing , it can make major impact on his overall returns , not precentage points wise but at absolute levels , as 14% and 16% are close in return percentage point over long term , but at absolute level they can be as high as 50% higher , like if you do SIP of 1000 for 30 yrs , at 14% you get 55 lacs , but at 16% , you get 88 lacs, this extra 2% gives extra 33 lacs ,and it might be result of these timings , which is not exactly timing the markets , but through portfolio rebalancing ! I hope I have made it clear for you ? Thanks for the detailed response. Again this seems to a case of interest driven investing vs goal driven investing. In a goal driven case the investor is clear that he wants only 55 lacs. He/She then determines the interest rate based on how much can be saved. As long as the portfolio delivers at the computed interest rate or more no re-balancing would be necessary until the time for the goal nears. In this approach, I would underestimate long term interest rates despite having enough equity component. So If I get 55 lacs I am happy. If I get 88 lacs I am happy (a little more) and attribute it to my underestimation. The point is I do everything I can to make sure the goal of 55 lacs is achieve with high probability. Anything extra is a (welcome) plus but I dont expect it. This is the key to my happiness. So when the sensex hits 20k or 15 K I watch with intest but dont act as long as my estimated CAGR is met with. In the interest driven investing (well I am not a fan of this because) there is a little greed involved somewhere beneath. As Gordon Gecko would say, greed is good but requires a lot of researching and informed decisions. Often students come to me saying they have a lot of interest in physics but don’t follow it up with the reqd effort. Like interest greed is a common emotion and like academic effort market reserch is an uncommon trait. At the end of the day we can only things what make us happy. Even here we must know what makes us happy! recently i have gone through some good mf where three year returns are becoming negative and ranked 2 star,but still if any body had invested there on every fall or through SIP, they have sure gained 18% cagr.hence in my view if anybody is really serious to make profit in long run in equity market ,they just need patience and confidence on their investments.rather timing the market. I dont see any conflict in what I say and what you say , even I recommened buying on dips and when stocks are available on good prices ? What part of the article you dont agree with ? Your graphics is excellent and its explained all the things you want to say in your article. Thanks , Yes … I think its appealing to eyes and gives the idea faster too 🙂 .Dont you think each article should have one image ? Good article. However – whatever people do now – most will be regretting later – either saying oh. gosh – i should have exited completely or – oh gosh. why i exited half of what I had. You know what I am talking about – why don’t you have a post on imaginary gain or imaginary loss – the “could have beens” of stock investing. Yes , what you say is correct for most of the people and it happening because they pass the buck on others , if they take responsibility of their actions based on some reasoning , they wont say like that . I agree Manish. The market has given Sell signal few days back and technically, my target for Nifty is 5550 in coming days. I fear of heavy selling in next week with 10% downside circuit on a single day. Market needs just one bad news to trigger that. My purpose is not to spread panic but one should remain cautious. One can purchase more quality stocks, mutual funds or do top-up in ULIP around that level. How did you come at 5500 ? I think 5700 is the min it can see, before the upmove, if it breaks even 5700-5600 , then it might turn in bloodbath ! . I see 5700 as support point by joining the previous top in 1 yr chart , before the recent upmove which happened from 5600 onwards ! , can you see it ? I think you should be able to answering this based on the article ! . Why are you still confused ? As they say you should continue the SIP’s regardless of the up/down’s of Market if you are long term investor hence I am confused. Shall i redeem the amount and continue my SIP’s? One more query if you are having the balanced fund like HDFC Prudence then no need to act right ? since the Fund Manager will do the rebalancing for you. Am I correct? Yes . Its not exactly the rebalancing which they do , but they make sure they stick to the mandate of having the origianl ratio proposed . So if the funds has 60:40 ratio ,at all time they will be around that ratio only . By the way, very great suggestion.. I was already thinking of putting my 50-60%% money in debt from equity in ULIP. Would be doing that only on Monday. I changed it 🙂 . I wrote the article 1 week back 🙂 . You should shift from Equity to debt for sure ! I have just checked my proposal form for my ULIP Policy from SBI Life taken 2.5 years back. 1.Equity Optimiser fund-60-100% in equity and rest in money market instruments. 2.Equity Fund-80-100% in equity, rest in debt and money market instruments. 3. Bond Fund-80-100% in debt instrument and rest 0-20% in money market instruments. 4. Growth fund-40-100% in Equity and 0-60% in debt & money market instruments. 5. Balanced Fund-40-60% in equity and rest in debt. I discovered that my allocation of units in this policy is 100% in Growth Fund. Does that means, fund manager of AMC takes care of switching from equity-debt and vice versa? Cant I do portfolio rebalancing in this ULIP as I intend to move 60% in debt and 40% in Equity at the moment? P.S.-After the market would bottom out, I intend to switch to 80-90% Equity Fund from the 100% Growth Fund which I am currently holding.